From covering the Macy's Thanksgiving Day parade to baking, here's how the TODAY team celebrated Thanksgiving. As the turkey coma wears off, TODAY anchors are sharing some cute photos of their Thanksgiving celebrations. Whether they were braving freezing temperatures to report on the Macy’s Thanksgiving Day Parade or cooking at home with their loved ones, the TODAY family found beautiful ways to celebrate the day. After reporting on the parade in the morning, Hoda Kotb celebrated Thanksgiving at home with family, food and football. She shared a photo of her family gathered around the table with the hashtag #grateful. Weekend TODAY co-anchor Sheinelle Jones drove to Philadelphia to spend Thanksgiving with her family. Then, it was straight back to New York City to be at work the next morning. Of course, the trip was totally worth it! Click or swipe through to see all her sweet family pics. Al Roker and his wife, Deborah Roberts, were all smiles at the Macy’s Thanksgiving Day Parade. Good thing they both wore cozy hats, because this year’s parade was the coldest on record. Al shared another fun photo from the parade with Hoda and Savannah Guthrie. While Savannah was out reporting the Macy’s Thanksgiving Day Parade, her children, Vale and Charley, stayed warm at their grandma and grandpa’s house and watched the celebrations on TV. 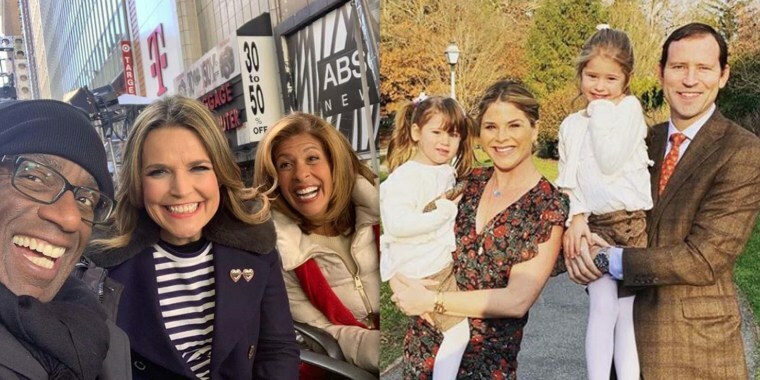 It looks like Savannah and Hoda were having a great time, despite the freezing temperatures! Meanwhile, Craig Melvin and his wife, sports reporter Lindsay Czarniak, headed to South Carolina for some Thanksgiving family time, sporting some spectacular, festive sweaters along the way (are those Thanksgiving tacos?). Dylan Dreyer spent the holiday at home with her family. She gave us a glimpse of her meal prep with husband NBC Nightly News cameraman Brian Fichera, and even shared a video of her adorable “sous chef,” 2-year-old son Calvin, helping make the pumpkin pie. Looks like everyone had a wonderful Thanksgiving spent with family and friends!